Father Robert Streveler, senior priest for the Diocese of La Crosse, was involved in the transition between the Capuchin ownership and the founding of the non-profit corporation that currently runs St. Anthony’s. He provides the sacraments to retreatants, along with occasionally leading seminars. I was born on March 20, 1943, the third child of Michael and Anna (Osterbrink) Steveler, at St. Mary’s Hospital, Wausau, WI. I have four siblings: Joyce, Earl, James, and Raymond. I grew up on the family dairy farm. I was baptized, received first communion, reconciliation, confirmation and ordination all at St. Patrick’s Parish, Halder. It was there that I attended St. Robert’s School, grades one through eight. After graduating from the 8th grade in 1957 I attended Holy Cross Seminary, In La Crosse for High School graduating in 1961 and College. During my time there I was active in sports, worked on the Grounds crew and the library. After graduating from Holy Cross with a B.A. in Philosophy in 1965 I went on to St. Mary’s University and Seminary in Baltimore to study Theology for 4 years. Besides my studies I worked in the library. I also volunteered at Rosewood State Hospital for the mentally challenged and worked at St. Peters the Apostle Parish in the inner city of Baltimore. 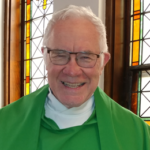 I was ordained a deacon in 1968 and ordained to the priesthood for the diocese of LaCrosse by Bishop Freking on May 24, 1969 at St. Patrick’s Parish in Halder. My first appointment as a priest was as an associate pastor at St. Joseph’s parish in Menomonie (west of Eau Claire). After a year there I was appointed associate pastor at SS Peter & Paul Parish in Wisconsin Rapids from 1970-73. From there I moved on to Stevens Point where I taught at Pacelli High School from 1973-75, was Associate Pastor from 1973-79 at St. Bronislava in Plover, a young and growing parish where I worked with the youth and spent a lot of time visiting the sick and celebration the Sacraments. During this time I was also chaplain for the Portage County Home and chaplain for the Christian Brothers who ran Pacelli High School. In 1979 I was appointed pastor to Guardian Angels Parish in Almond and St. John the Baptist Parish in Heffron. While there I was involved in the diocesan Teens Encounter Christ program and got to see a lot of Wisconsin on my bicycle. In 1985 I accepted an appointment to St. Mary’s in Greenwood where I continued to work with Teens Encounter Christ, taught religion in the Parish School and reached my goal of bicycling in every county of Wisconsin. In 1989, Bishop Paul pulled me out of Greenwood and appointed me to be pastor of St. Therese Parish Rothschild-Schofield. Here there was a school that was part of the Wausau Area Catholic School System. After years of being pastor in small parishes and doing most things myself I now had a parish staff, janitor, youth director, secretary, music director and religious education director. We had a large cemetery and an empty convent to take care of. Fr. King, a retired priest who lived nearby took a Mass everyday. Within a couple of years we turned the convent into apartments for the elderly but it took a few more years than that to get those approximately 20,000 trees planted in the cemetery. In the fall of 1992 I went to Rome for an eleven week sabbatical. During that time I got to visit dozens of churches in Rome, listen to many lectures, do long weekends in Assisi, Florence and Siena and do my first pilgrimage to the Holy Land. Returning to St. Therese I immersed myself in Parish work. In 1999 Bishop Burke added St. Agnes in Weston to my responsibilities. In the year 2000 we did some renovations of St. Therese, including the addition of a greeting area. In 2002 Bishop Burke appointed me as pastor of St. Joseph Parish in Black River Falls. Besides parish work I also volunteered at the nearby state prison where I celebrated Mass, heard confession and taught religion classes. In 2007 we renovated the church, putting in ceramic tile and new carpeting, painting and redecorating. In 2008 I received an appointment to be pastor of St. John the Baptist, Edgar and in 2011 Holy Family, Poniatowski was added to my responsibilities. In 2010 we renovated St. John’s Church: painting, redecorating, putting in new carpeting and ceramic tile. In 2013 the Capuchins announce that they were leaving St. Anthony’s Spiritual Center in Marathon. I became part of a group to keep it open. In 2015 I retired from being pastor of Edgar & Poniatowski and moved to St. Anthony’s as priest in residence. I’m still here, celebrating Mass, hearing confessions, etc.